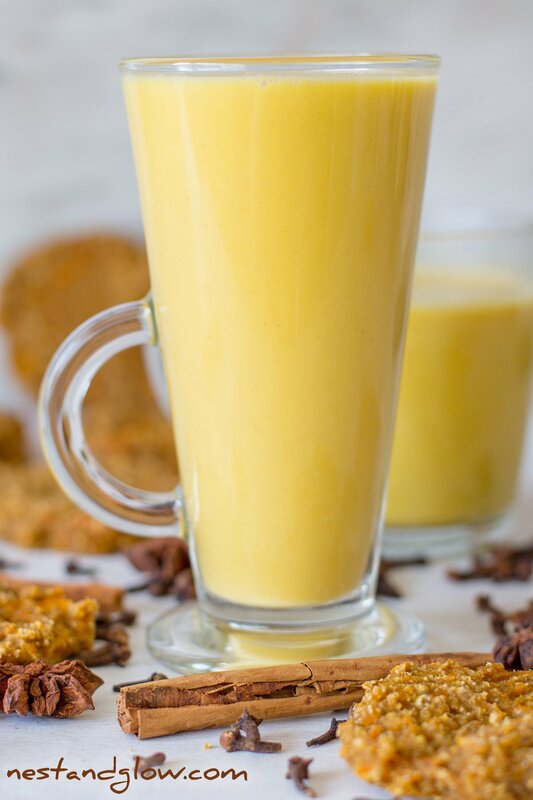 This pumpkin spice latte Suitable for paleo, vegan, plant-based, gluten-free and refined sugar-free diets. Loaded with heart healthy fats and nutrients from the spices and pumpkin. One glass counts towards your daily fruit and veg portions with the cashew nuts and pumpkin. My pumpkin spice latte is made without any syrup. mixes and refined sugar free. All the flavour comes from spices and the pumpkin. 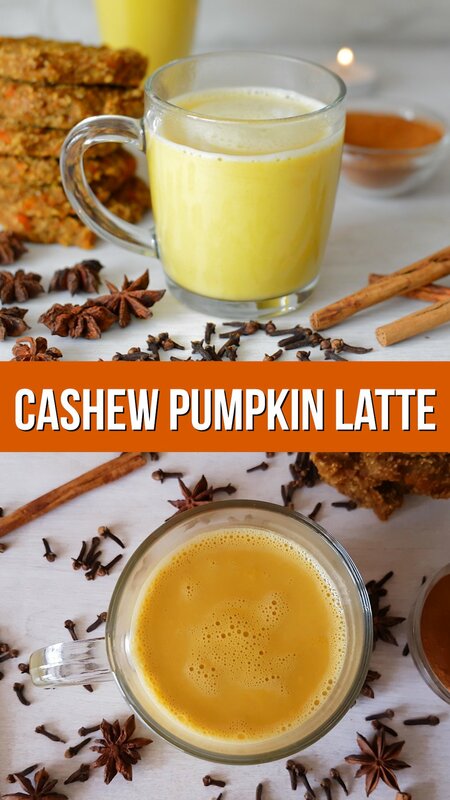 As this is high in natural produce it contains no empty calories and some call it a low calorie pumpkin spice latte. I roast my pumpkin dry in the oven to make a sweet caramelised pumpkin without any added oil. But you can use any cooked pumpkin that you like. If you do use shop bought then choose a brand that doesn’t have added sugar for a healthy pumpkin latte. The cashew pumpkin latte concentrate will last several days in the fridge. Mixing 50 / 50 with boiling water creates a warm beverage that is ready to drink straight away. For a really hot drink you may want to heat the pumpkin cashew concentrate in a pan. Five spice is a mixture of star anise, fennel seeds, cloves, cinnamon and Szechwan peppercorns. It’s different to all spice as this is a variety of dried berry. You can substitute with just the spices from the five that you like. I like to always add at least fennel, cloves, and star anise – but remember a little goes a long way. 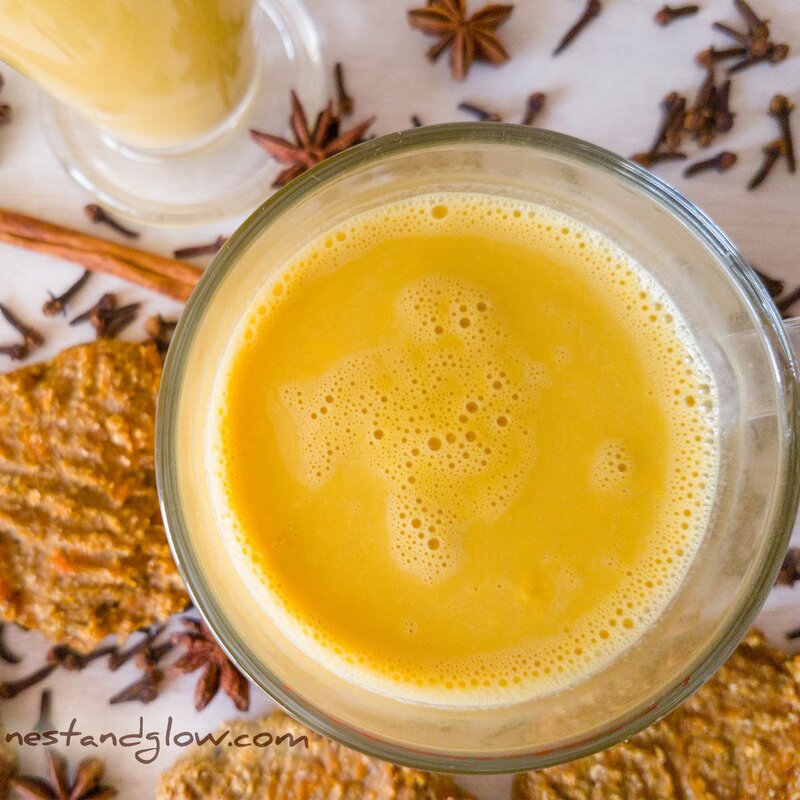 I use my own blend of pure spices rather than using a pumpkin spice mix to make this latte. This makes it cheaper, makes sure there is no refined sugar and easy to get the same taste as spice blends vary so much. Just the concentrate alone for this is delicious. You can make it into a frosting by adding just enough water to let the blender blend it smooth. 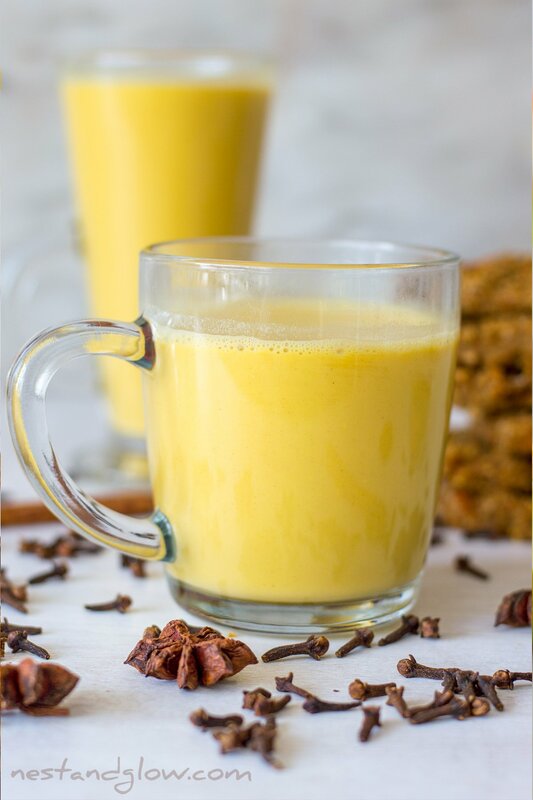 This pumpkin spice latte can also be made raw if you don’t cook the pumpkin and mix with warm rather than just boiled water. 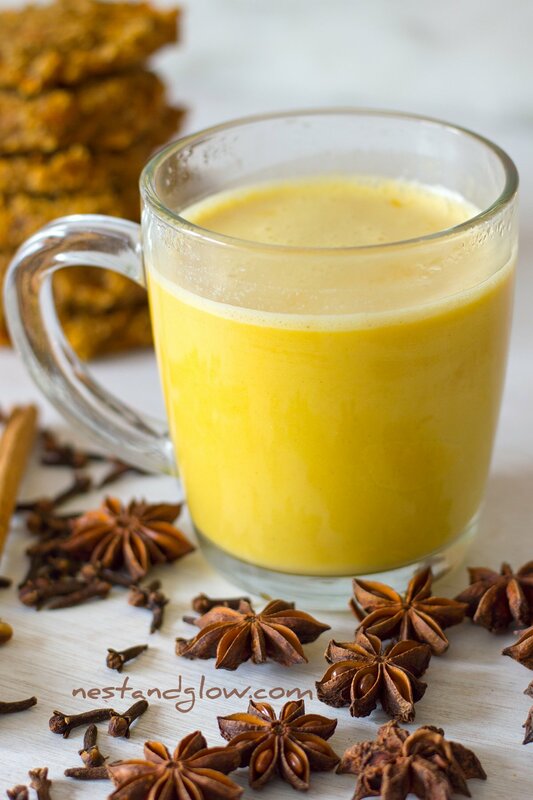 It won’t have quite the sweet almost caramel flavour of roasted pumpkin but is still a tasty warming drink and is suitable for a raw food diet. To make caffeine free cashew latte use a coffee substitute like roast chicory root. This is what I actually used in the recipe for the video here. Use normal cold brew coffee or espresso for a traditional latte flavour. 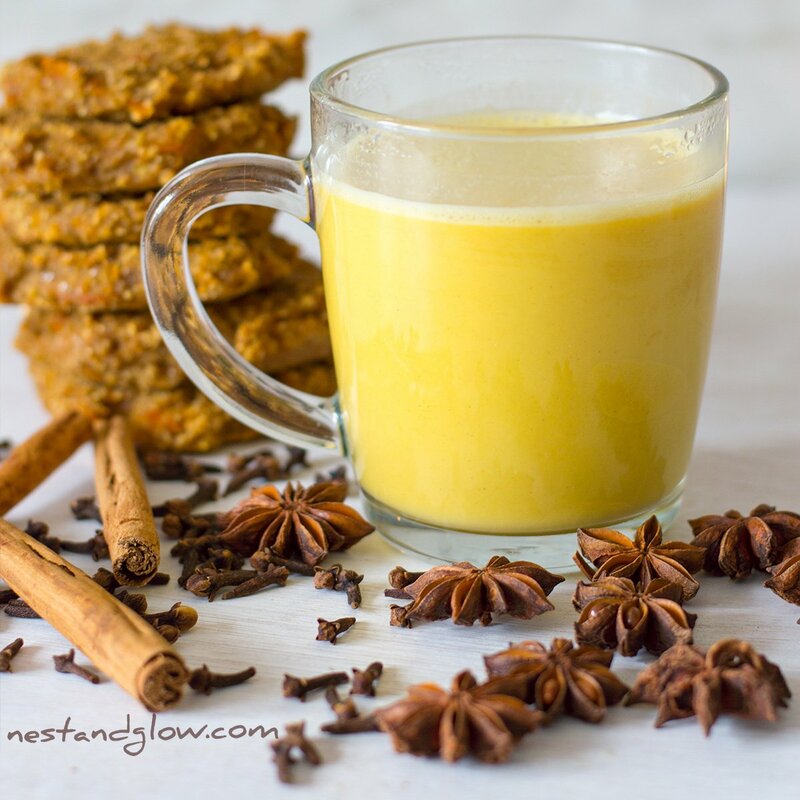 With my Tumeric Ginger Cookies several people commented that black pepper was needed for absorption. I’m not really sure if that is true as I was under the impression that just fat was needed as the vitamins are fat soluble – so the cashews should be enough. But anyhow I’m adding a pinch of black pepper to this as the flavor does work well here. If you can’t get hold of pumpkin then use another winter squash such as butternut squash. They both belong to the same family and can be used interchangeably in recipes. I’m not using any plant based milk in this recipe as I make my own by blending fresh cashew nuts. This means none of the nutrients are lost when you separate the pulp and all the fiber remains. Most shop bought plant milks contains just a couple of percent of the nut or seed they are named after. However almond milk isn’t unstainable like the dairy industry would like you to believe, it’s just great transporting all that heavy water. You can replace the cashews with pretty much any other nut or seed but unless they’re macadamia nuts it’s advisable to blend first then separate the pulp. See my seed milk recipes for more information on this. Pumpkin doesn’t just look and taste great it’s also very good for you. It contains high amounts of Lutein and vitamin C that may help protect your eyesight as you get older. If using fresh pumpkin dry roast the skinned and de-seeded pumpkin for 40-50 mins at 230C / 450F until it starts to go golden. Place half of the water in a blender with everything else. Blend until smooth and slightly warm. Pour into 2 mugs and top-up 50 / 50 with freshly boiled water to make your pumpkin spice latte.